After the repeal of Prohibition in 1933 and the adoption of the 21st Amendment, every U.S. state established the three-tier system for the distribution of alcoholic beverages. Through this system, South Carolina balances public safety and a dynamic marketplace. The consumer-friendly framework of regulations drives responsibility and accountability across the industry with tremendous economic benefit to the state. negating monopolies within the system. 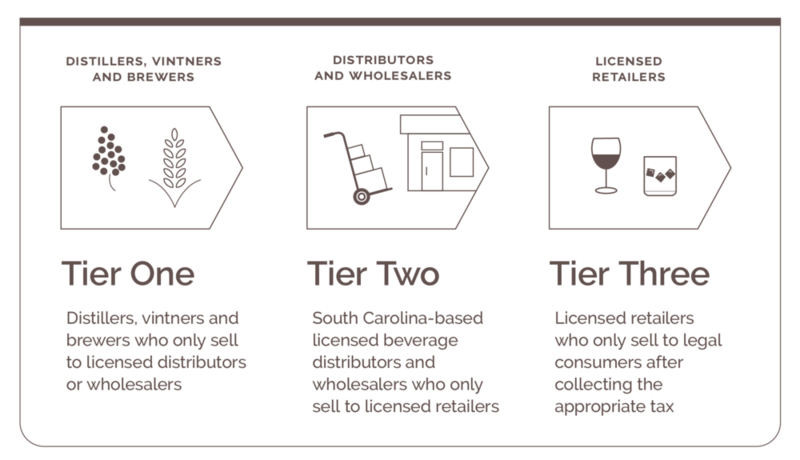 Our association represents the second tier of the wine and spirits industry in South Carolina - the link between producers and consumers. Association members are the local marketing, logistics and distribution experts for the thousands of products available to consumers at retail locations across the state. These sites include on-premise locations — bars, taverns and restaurants — and off-premise locales, like package liquor and retail stores. The wholesalers work with entities to develop brands, grow markets, educate consumers and promote responsible enjoyment of wine and spirits. South Carolina's wholesalers save the state money by accurately and efficiently collecting and remitting state excise taxes — $34.26 million in 2016.
Review the laws governing the alcohol beverage industry in South Carolina.